Tonya and I can't thank you and your team enough. Before starting with you guys, we were having the worst and most frustrating experience. When we decided to change realtors we anticipated a rocky road and hoped for the best. We couldn't have been more surprised by the smoothness and stress-free experience we had with everyone on your team (a little stressful on the buying end!). We will forever be grateful for everything you all did! It is the least we can do to leave you all a review on the sites you sent us. You all will forever be our go to for any future real estate transactions we do and we will refer you to anyone needing an agent. Once we are all settled into our new place we are definitely inviting you and Mary over for dinner! I recently worked with Mary and Zee to both buy a house and sell a house in North Park. I had bought property before, but had never worked with a real estate agent. (I am a real estate attorney and had handled the transactions myself.) I sought out Mary and Zee because of their intimate knowledge of the North Park market and because they had been highly recommended by several friends and acquaintances. Working with them was absolutely amazing. The level of service we received was outstanding. Mary was organized, professional, hard-working, thorough, efficient, and dependable. She is extremely knowledgeable about not only the market,but all aspects of a sale on both sides of the transaction. I felt completely comfortable relying on her expert advice and really appreciated her matter-of-fact, calm, and subtle manner of negotiation - extremely effective. In addition, Mary and Zee are warm, caring, and generous people - they truly take customer service seriously and to the next level and beyond. 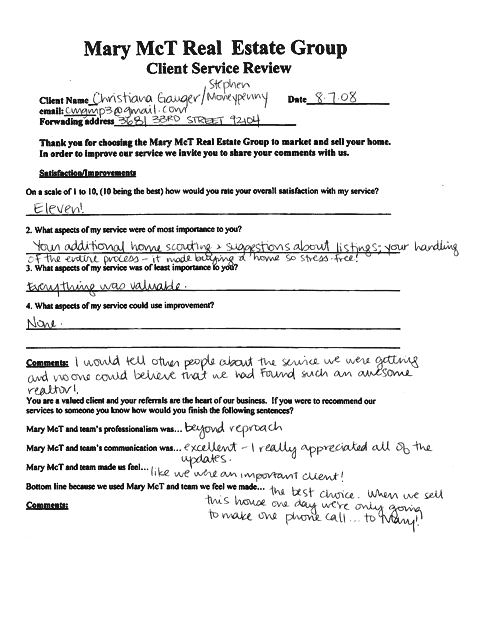 Mary McT and team's professionalism was a breath of fresh air. Their communication was abundant, very responsive, and more importantly proactive. Mary McT and team made us feel comfortable and like we had a team of advocates working behind the scenes for us. By the end of the process, one of our kids had started calling her "Aunt Mary." Bottom line because we used Mary McT and team we feel we made the right choice for both the sale and purchase of our new home. I recently enlisted the services of McT Real Estate Group, particularly Z. Contreras, Realtor, and Mary McTernan, Realtor. I have purchased and sold five properties over the years, but in all my years of experience with realtors and brokers, I have never been as impressed as I have been with these two professionals. I personally manage two corporations and am aware of the importance of good communication, subject knowledge, integrity, availability, the willingness to deal with unusual circumstances, and knowing the market you work in. Selling a home is an emotional experience for the seller and the buyer. To have a professional real estate team successfully work within the time constraints and handle unforeseen problems, made my experience a positive one. I consider myself blessed to have these two realtors who were on top of everything and who had a handle on possible problems before they ever occurred. Thank you, Zee and Mary, for your guidance, positive mental attitude, high caliber of integrity, honesty, and structure which all together, resulted in an excellent home selling experience for me. 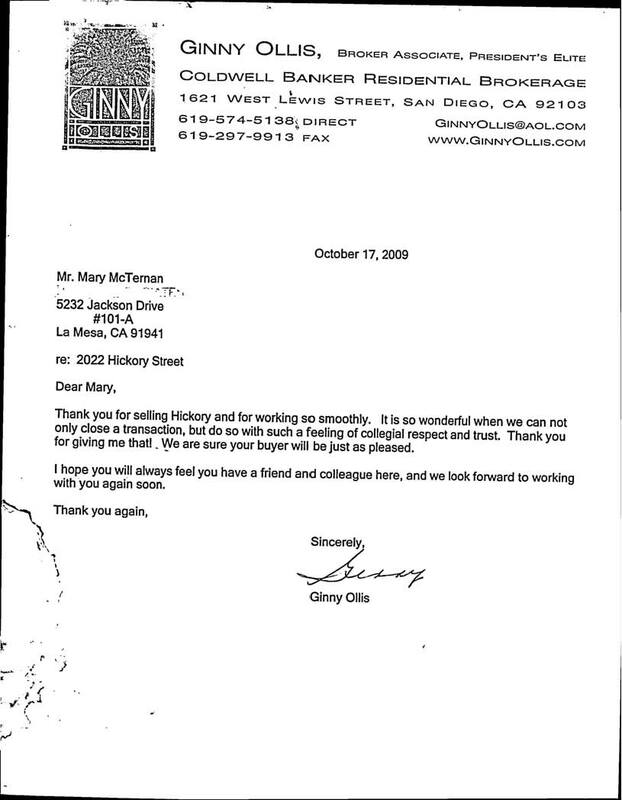 Realtor, and Mary McTernan, Realtor. willingness to deal with unusual circumstances, and knowing the market you work in. unforeseen problems, made my experience a positive one. who had a handle on possible problems before they ever occurred. 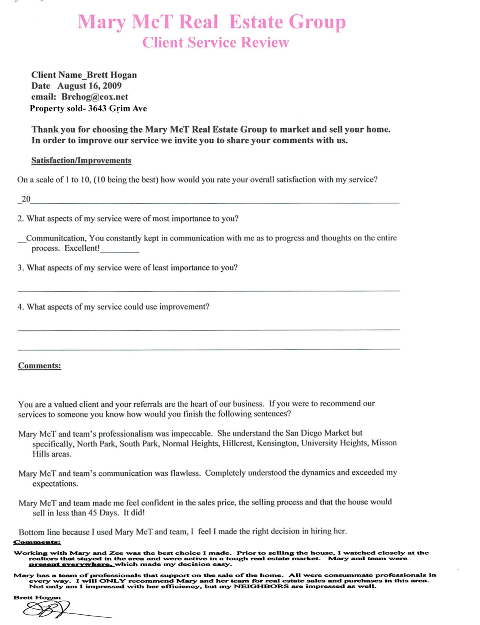 If you are selling your home in the North Park area, the only agent to see is Mary McT! Mary and her partner Z are experts at selling homes in North Park. Mary specializes in the North Park area and works hard to get the best price for your home. Her and Z are very attentive to your needs and concerns and do everything possible to make selling your home a smooth, efficient, and hassle-free experience. This was my first time selling a home and there were some extenuating circumstances that I knew would complicate the process, but Mary assured me that she could handle anything that came up. When trouble did arise, as I knew it would, Mary tapped into her seemingly inexhaustible resources and kept the sales process moving along. Throughout the whole process, Mary and Z seemed more like longtime friends rather than just real estate agents selling another house. Any concerns or questions I had were quickly taken care of by Mary or Z. I always felt like I was their number one client (even though I knew I wasn't). I cannot recommend Mary and her team enough to anyone selling their home In North Park. Mary and Z are simply the best. Hey Mary, thanks so much for the wine you sent. That was especially thoughtful of you. Thanks for your hard, quick, and always accurate work. I hope to send some referrals your way! Just a note to thank you very much for the gift and for doing such a great job helping us sell our house. Although it was extremely crazy at the end (and maybe a little tense on our part) everything seemingly went well and we are very pleased with the outcome. Many apologies for leaving the place without patching and being able to get the remaining bits of trash, as we were a bit frantic at the time and were not able to get to everything. We still seem to be digging out quite a bit. Again, thanks for the hard work and great results - we definitely will recommend your services to others! The customer service I received was exceptional! Communication was frequent and comprehensive. I always knew what was happening and what needed to get done. I felt like I was their only client and selling my house was their priority. The entire process was first rate; from staging my house, frequent open houses, continuous feedback, attention to detail, taking initiative, making the extra effort. It all worked! All around excellent service! Selling a home in this economic environment was a scary proposition. 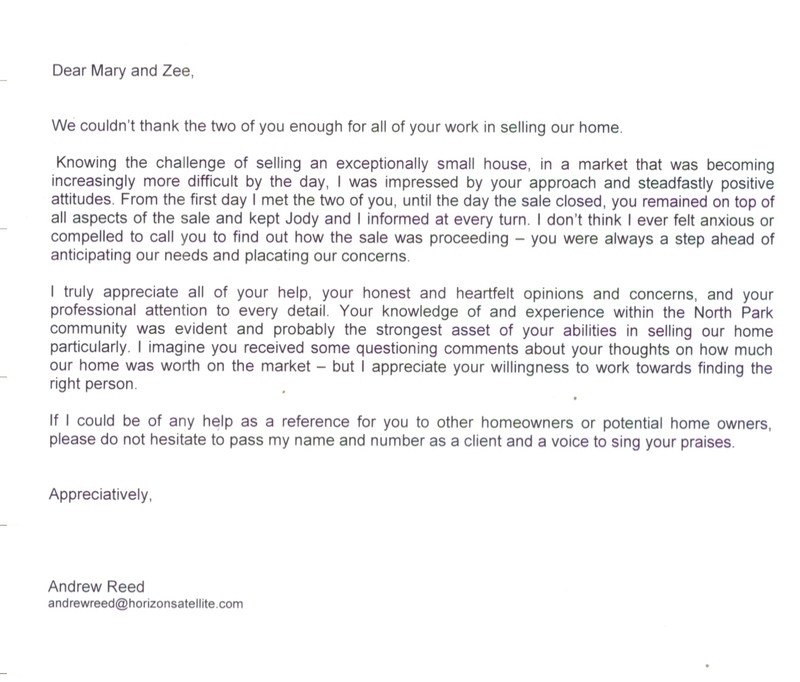 Mary McT and her very efficient team were exceptional every step of the way. 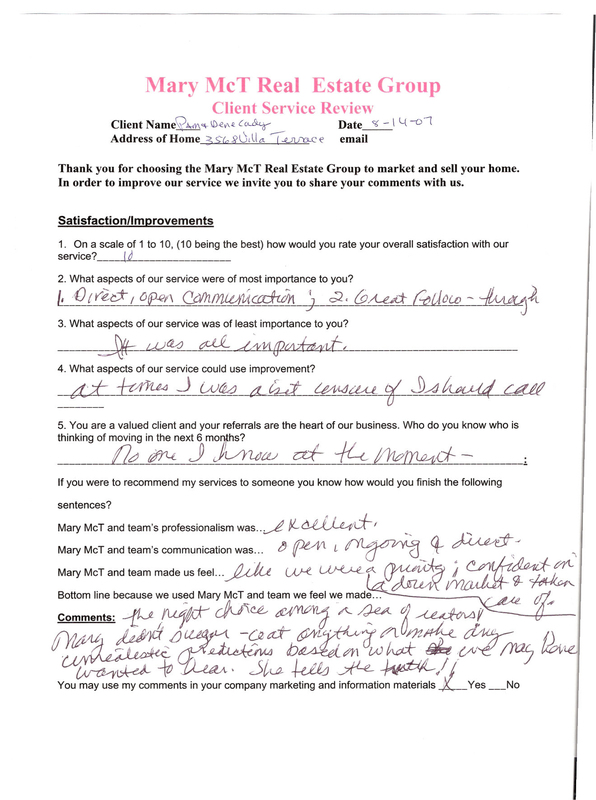 Their business acumen combined with their outstanding customer service make Mary McT the best realtor on the planet! I can' t adequately express my gratitude to both of you for ALL that you did, way above the call of duty. You're not like other realtors; you're more like mother-hens, noticing everything, solving every problem, offering encouragement at every step. The organization you've created is extraordinary. You have some expert person to plug in to every problem. Now that I think of it, you're really more like mafia bosses, with soldiers at your beck and call. It all works beautifully; don't tell the cops. Please let me take you to a great dinner in San Diego. The movers are coming tomorrow, the cleaners the next day, and I'll ship my car from Philadelphia where I'll stay for some days with my sister . I'll call you when I get to Shawn and Irma's. Thank you for choosing the Mary McT Real Estate Group to market and sell your home. In order to improve our service we invite you to share your comments with us. On a scale of 1 to 10, (10 being the best) how would you rate your overall satisfaction with my service? 2. What aspects of my service were of most importance to you? 3. What aspects of my service was of least importance to you? 4. What aspects of my service could use improvement? If you were to recommend my services to someone you know how would you finish the following sentences? Thank you both so much for everything! You were seriously wonderful to work with. 3. What aspects of my service were of least importance to you? You are a valued client and your referrals are the heart of our business. If you were to recommend our services to someone you know how would you finish the following sentences? Mary McT and team’s communication was clear and timely. Most times I received a call from Mary before I needed to call her. 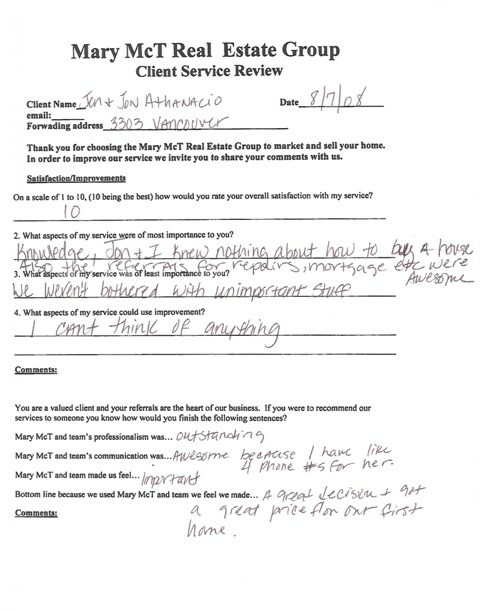 Mary McT and team made us feel that we were being represented by a realtor that had high expectations of the level of service and professionalism they provided. Comments: At first I had doubts that Mary and her team would actually do all the things they promise to do in their promotional literature. 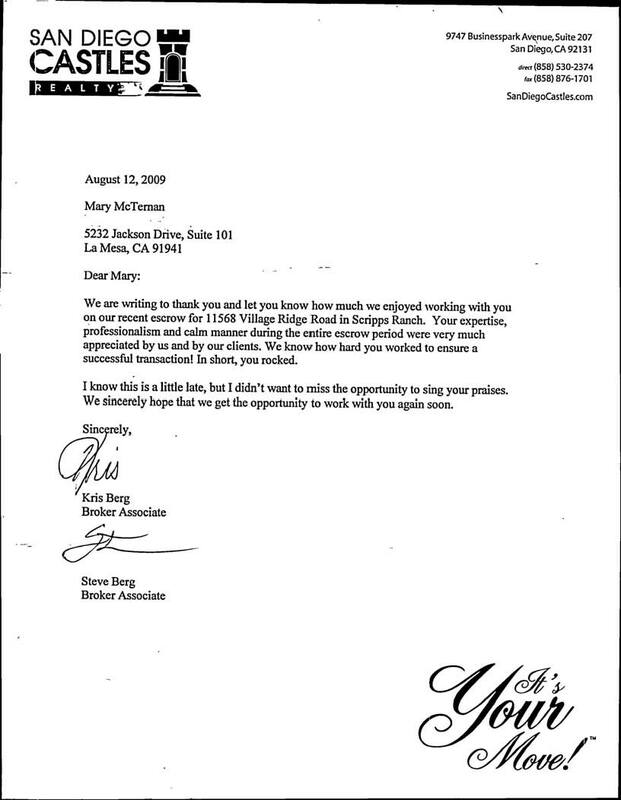 They did everything they promised along with providing professionalism at a very high level. I would use them again and recommend them to everyone. Lots of communication and fast answers day and night to all of our questions. Your working relationship with Chris Scelfo, you two work great together. Being first timers, every aspect seemed important to us. We are 100% satisfied, I cant think of anything that needs improvement. Mary McT and team’s professionalism was…excellent. Mary McT and team’s communication was…the best. Immediate responses to emails and phone calls day or night. We never had a question go un-answered. Mary McT and team made us feel…Like friends or family members. After closing we were a little sad to know that we wouldn’t be talking with Mary on a daily basis anymore. Bottom line because we used Mary McT and team we feel we made…a great decision. 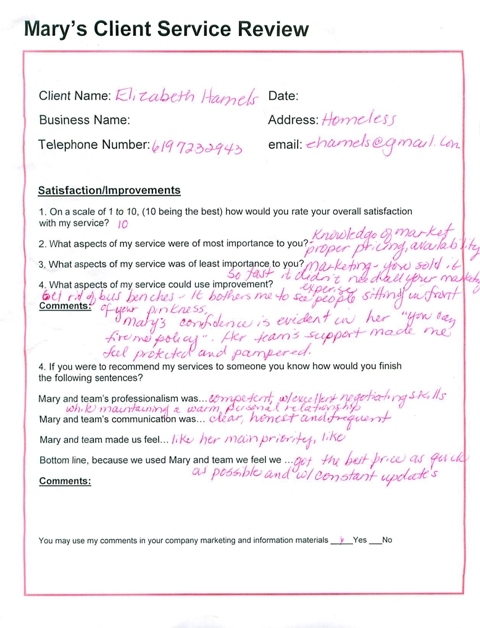 We were not pressured in any way, Mary was very upfront and honest through the entire process. Choosing Mary as our agent was the best decision we made. Mary took the time to explain everything as many times as needed, we learned a lot through this process. We were never pressured or pushed in any particular direction. Before meeting Mary I had talked to another Realtor who seemed more like a salesman looking for a commission, I didn’t get the feeling that our best interesets would be met. That’s not the case with Mary. It was such a relief to know we were working with such honest and trustworthy people. 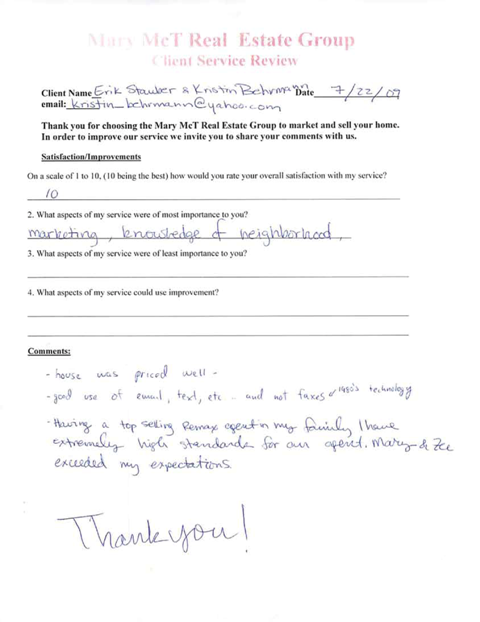 We will definatly recommend Mary and team to anyone looking to buy or sell a home. Mary McT and team’s professionalism was excellent. Mary McT and team’s communication was outstanding. 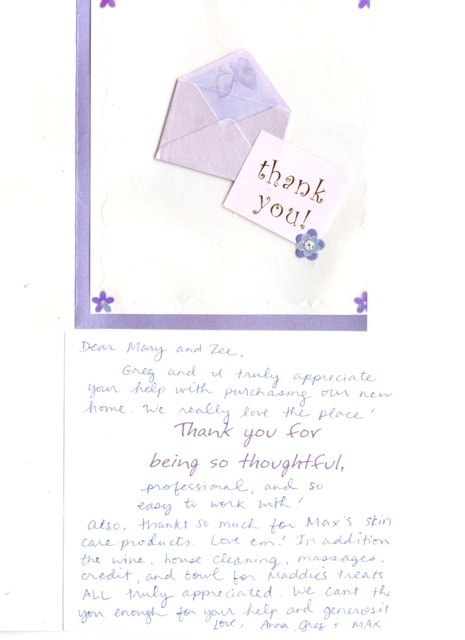 Mary McT and team made us feel like valued clients and friends. 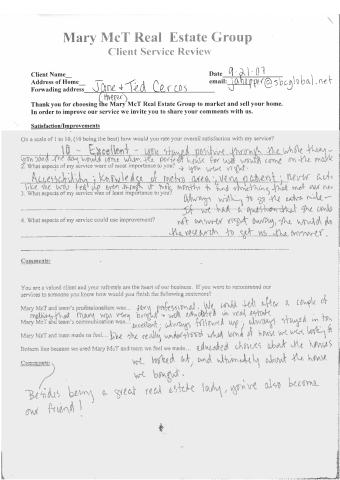 Bottom line because we used Mary McT and team we feel we made the right choice in selecting a real estate agent and would be happy working with her again. 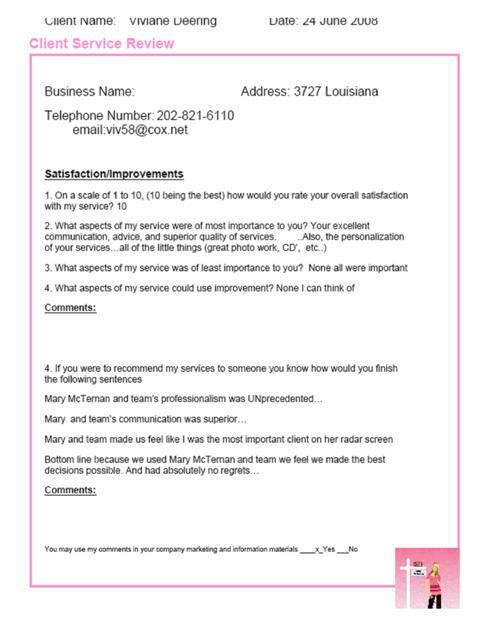 We enjoyed working with Mary. 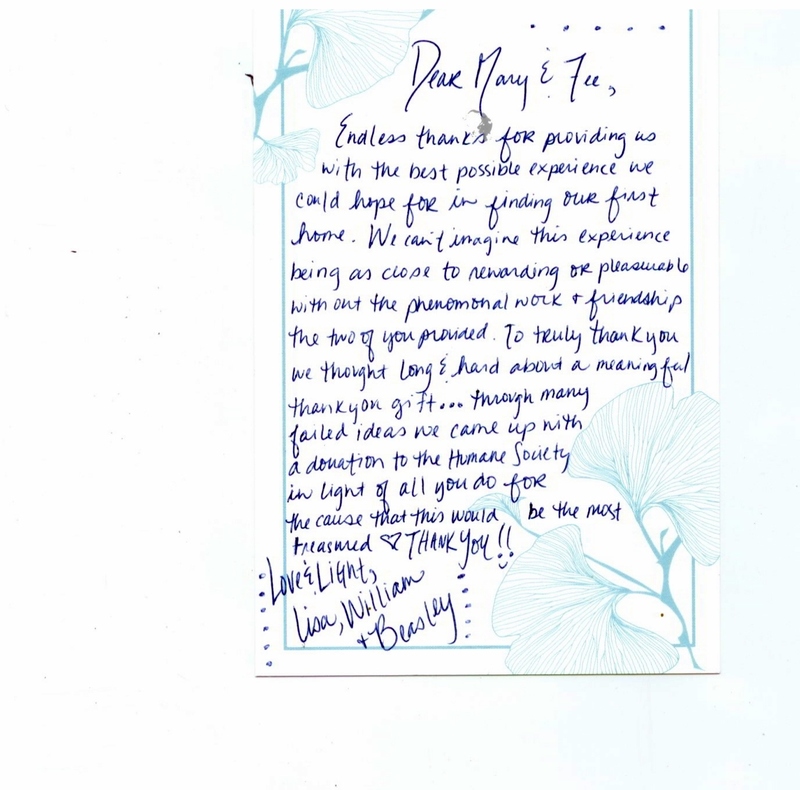 She understood our needs and assisted us in purchasing a great home.